So last Spring, almost a year ago now, I was in a mood to tackle a big project and to do it right. I don't know why that came over me--it's unusual! I am more of a "make it in a weekend" gal. So I decided it was time to make a trench. 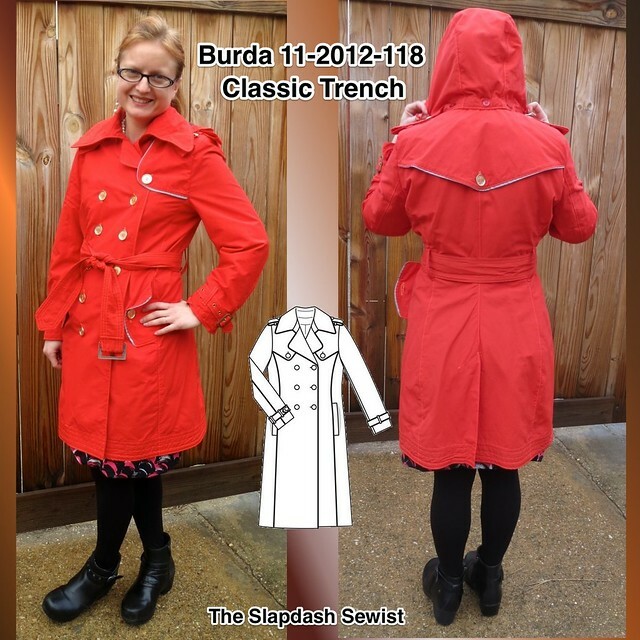 Burda 11-2012-118 is *almost* the perfect classic: it has the separate collar stand, double breast, and gun/rain flaps--but the latter are weird and asymmetrical. A totally unnecessary variant! However, it was relatively easy to turn them into the classic look, and the pattern needed only my usual fit alterations to be perfect. Fabric Mart had some fabulous red water resistant (more on that later) nylon allegedly from Marc Jacobs, I splurged on fabulous hardware from Pacific Trimming, and patiently got started. Well, back up. After tracing out and altered the pattern I cut it out in a coated linen I got from Fabric Mart a while back. Luckily, I thought to actually test the fabric for water fastness before starting to sew. Not only did the waxy coating on the linen offer no water resistance whatsoever, it seemed to actively soak up water *worse* than your average fabric. So that's in pieces in my sewing room still. So with the red fabric, I sewed some scraps together and tested various configurations. I found that by pressing the seam allowance to one side and topstitching, the seams were surprisingly waterfast and I decided not to use waterproof tape on them. I got the shell of the outer fabric most of the way constructed using my most meticulous craftsmanship...and then my partner and I bought a house. So that went into a box for months and months while we moved etc. Then in October we planned our trip to Italy--two weeks in advance (we had a rough Fall with deaths in each of our families). And since it was October, it was predicted to rain the whole time we were there. Eep! 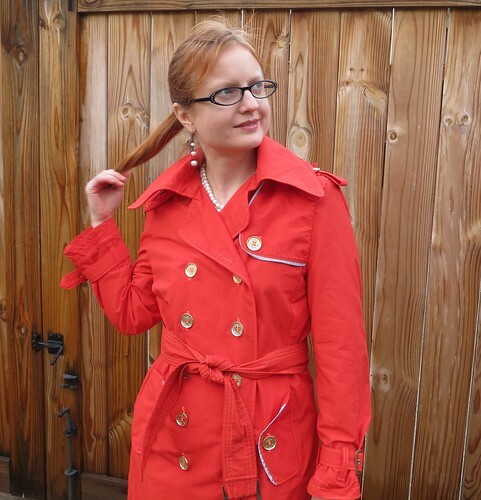 I needed the trench coat, and I needed it now! So much for taking my time on this project and doing everything right. There were a few special details that were important to me. I wanted to add some reflective piping, to give me more visibility when biking in the rain. I wanted the front storm flap to be functional. I wanted the traditional epaulets and sleeve belts, as well as tie-but-belt-buckle belt (I didn't put any eyelets in the belt). I wanted a chain for hanging it on a hook. And I wanted a functional but removable hood. And I wanted all this in two weeks. Hence, why there are no in-progress photos and no construction information. I figured I'd rather post (after months of silence) than spend another couple months trying to recreate the construction process. I kept a Burberry trench open on my computer at all times and used the zoom function on every possible detail. In the end, I think I only got one thing wrong. I looked at the pocket flap over and over and it really looked like it was attached behind the pocket and buttoned in front of it. I'm still not sure which way the Burberry goes, but I knew at the time it was probably a mistake and it was. As I discovered while walking home from work in a snowstorm while wearing my trench, the precipitation just blows right into the pocket. Alas. 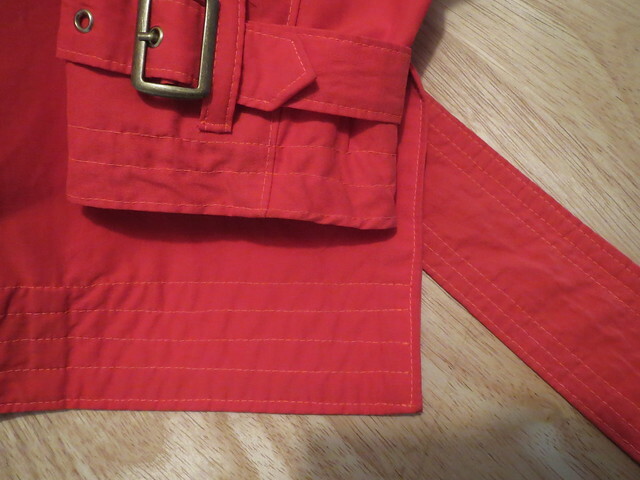 I will add a second flap on the front of the pocket so the flaps can button either way, depending on wind direction. I think my most proud detail on this doesn't even really show to the casual observer--the lined vent, my first one ever. I watched this video over and over and it really worked! It made me extremely nervous to cut away my lining fabric for the underlap side. I hate doing things that can't be undone. But I had faith and went forth and the vent is beautiful. My stupid mistake was that I haven't made a double-breasted coat in so long that I totally forgot that one row of buttons is functional and the other is supposed to be fake. I made them all functional. So there are a million buttons to button if I want to wear this buttoned. Ah well. 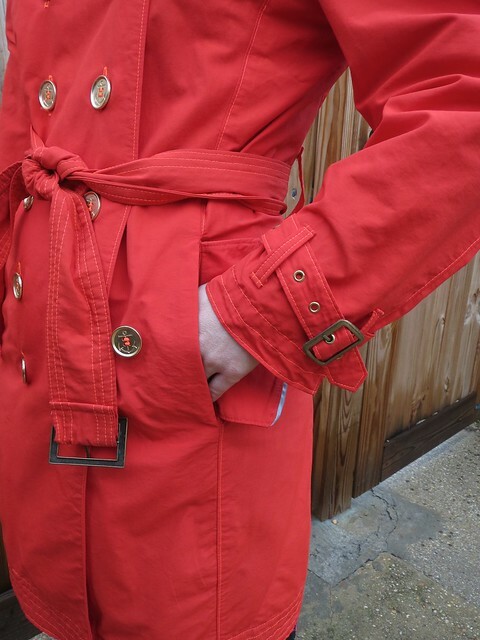 In a way it looks better, because if I just wrap the coat closed and hold it in place with the belt rather than buttoning it, which I do more than actually buttoning it, then you still get the effect of the double row of buttons. This fabric doesn't do "crisp." Cidell kindly took the photos and asked if I wanted to steam it first. Ha! In order to give the sleeves and hem *some* body, I sewed multiple rows of parallel stitching, which worked out pretty well. Believe it or not, the floppy pocket flaps are interfaced in heavy interfacing on both sides. I also interfaced the lapel to a little beyond the roll line on the fashion layer (as well as fully interfacing the facing). The only poorly done details on what was supposed to be a meticulous project are some of the buttonholes (appalling) and the hood doesn't really button under the chin. The hood was the last step and I was sewing it deep into the night before we left the next day for Italy. 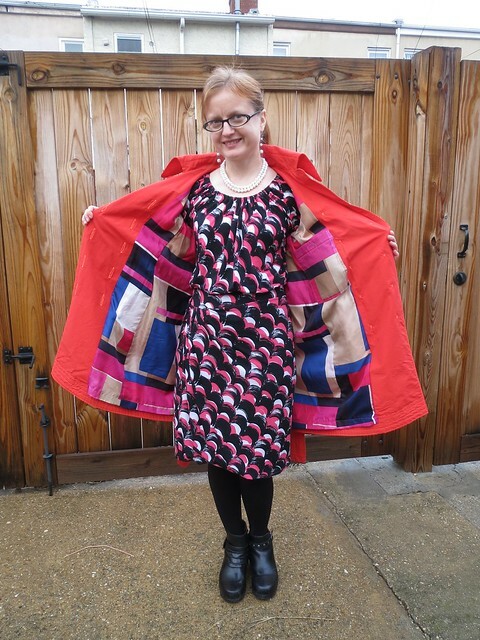 I found a Burda pattern with a hood, and shrunk it by about 30%(!) for my tiny child-sized head in a two muslin process. It amazingly looks pretty good, especially with the sporty mesh lining, but the ends are too thick to work the buttons into the buttonholes without extreme effort. Luckily, the drawstring (with red elastic cord purchased from Pacific Trimming for a luxe touch, rather than the more readily available generic black) and gold cord stopper keep it in place. It's lined with a silk print I got on eBay for a great price. The print has pinks rather than red in it, but I think it works. 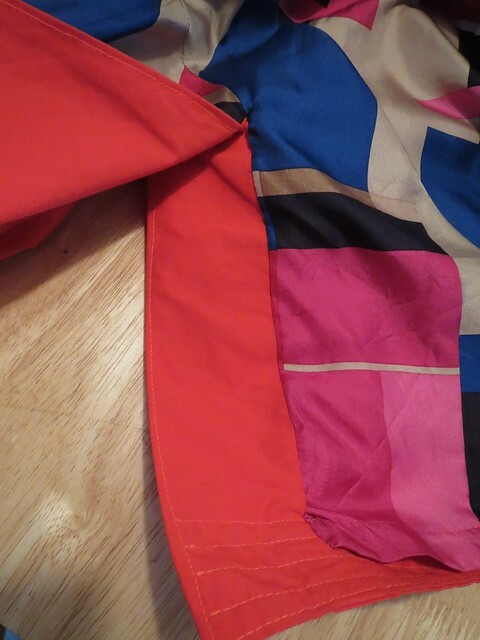 I considered adding an interlining layer, but decided I wanted the coat more for Spring/Fall and so the nylon + silk would be warm enough. In fact, it is the perfect weight. 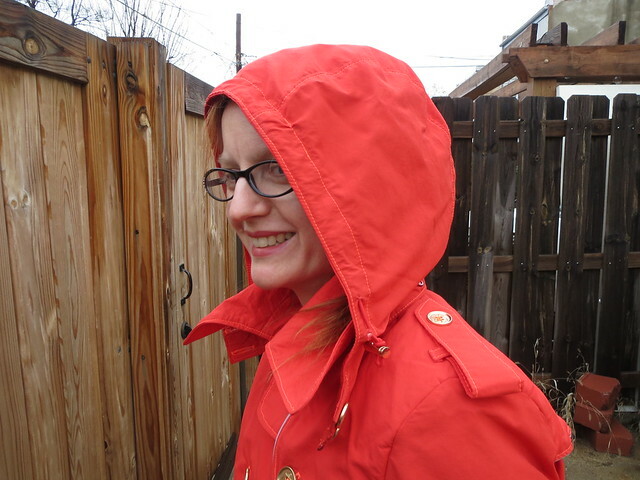 As mentioned, I was able to wear it when it was snowing with heavier underclothes (but it is not very cold in DC when it snows for the most part--just below freezing) and have already had plenty of use out of this Spring. 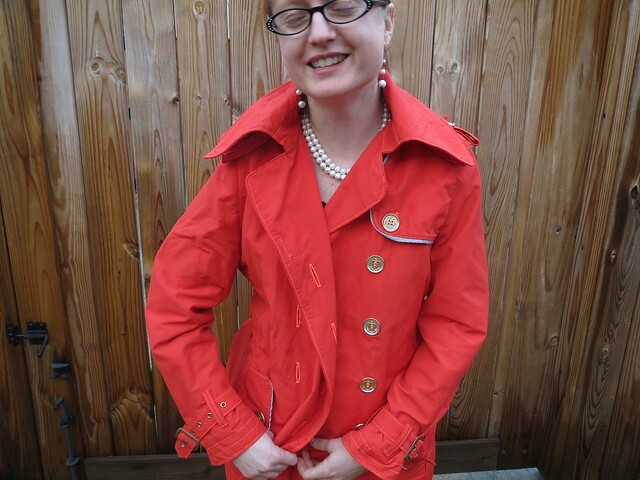 I was proud to wear this coat in Italy, though I flew too close to the sun and got soaked one day. Our last morning in Parma we ran out to get cheeses and bread and snacks for a picnic on the train to Bergamo. It was POURING. I just wore the coat, no umbrella. Well, if you have this fabric, let me warn you. It is water resistant. There is a big difference between water RESISTANT and waterPROOF, as it turns out, and I got absolutely soaked. In a light rain it's great. In a heavy rain, you have about 10 minutes of comfort and the rest of the day of drowned rat. It's no substitute for an umbrella! I had a moment of rage that I had put so much work into something that was supposed to last for at least a decade and it didn't function as intended. But now I'm over it. 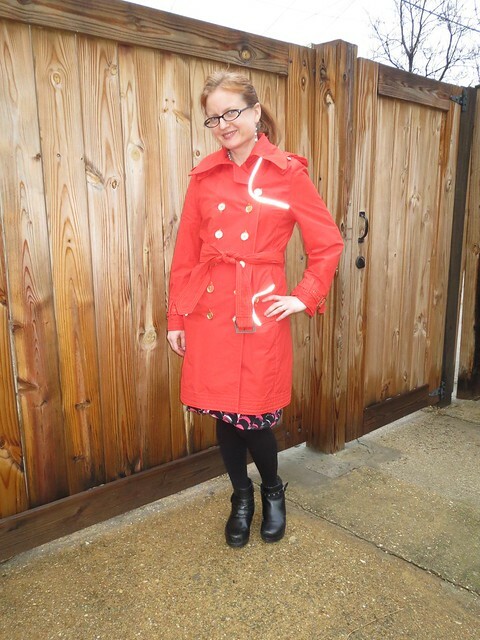 And really enjoying wearing this in our light Spring rains!